The epithelial lining of the cerebral ventricles and the central canal of the spinal cord. The lining is composed of a single cell layer. 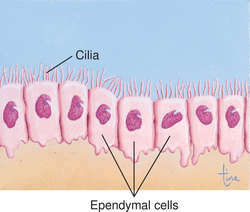 Most of the cells have microvilli and motile cilia on their outer surface. emanating from or pertaining to ependyma. squamous-to-columnar cell lining of the spinal central canal and the four ventricles of the brain; supports the choroid plexuses. 5) They arise from the ependymal glial cells and typically present as intradural/extra medullary lesions involving the lumbar and sacral spinal canal. Ependymal cells that line these ventricles have hair-like extensions that are thought to promote the normal flow of fluid. Scientists have struggled with the mystery of why stem cells can't generate neurons in a lab dish, but Duke University Medical Center researchers believe that a network of cells surrounding stem cells in the brain, called ependymal cells, is what allows stem cells to continue making new neurons. The scientists found that neighboring "epitheliallike" ependymal cells--not stem cells themselves--maintain a special structure that keeps neural stem cells "neurogenic," able to make new neurons. Often the condition is indistinguishable from PCNSL, and the lack of ependymal spread and additional imaging with single photon emission computed tomography (SPECT) and positron emission tomography (PET) can be helpful. The ventricles were lined by ependymal cells that were high cuboidal to columnar in shape. Glial tumors are the most common type of primary brain tumor with the majority being malignant, and they are derived from a variety of cells including astrocytes, oligodendrocytes, and ependymal cells. Astrocytes, ependymal, and oligodendroglial cells are all examples of glial cells that compose the supportive tissue of the brain. Endoscopic resection of intraventricular ependymal cyst presenting with psychosis.